Yesterday, we had the pleasure of meeting Cate. She is a beautiful eleven-month-old, forty-pound, Blue Heeler/Australian Shepherd mix. 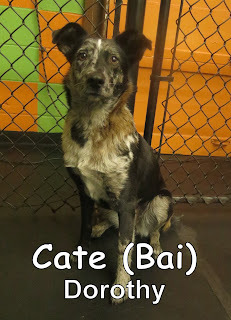 Cate joined our Medium Dog Program, where she spent the morning mingling with and observing the other dogs. She did a good job, and is welcome back anytime. We look forward to seeing her again soon! Cate was featured in yesterday's Facebook photo shoot. Check out the photos below.